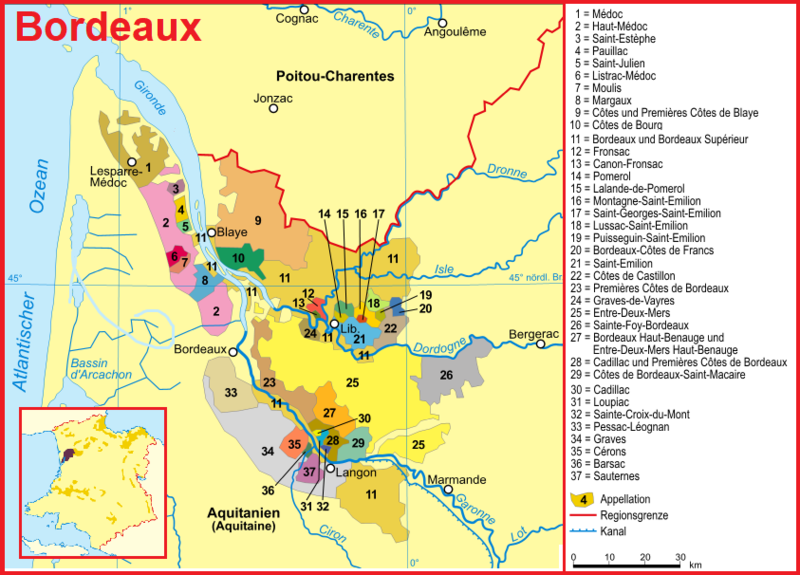 On the right bank of the Gironde dominated limestone with the two appellations Blaye - Côtes de Bordeaux and Côtes de Bourg, The waters also gave the department in Southwest France the name in which the entire region Bordeaux lies. In the area of ​​the department of Charente-Maritime, which borders the department of Gironde to the north, the terrain slowly becomes flatter and viticulture disappears. The mouth of the Gironde in the Atlantic Ocean is marked by the designated as "Pointe de Grave" headland at the community Le Verdon -sur -Mer. The entire right bank along from Dordogne and Gironde is called Rive droite (right bank), the entire left bank along Garonne and Gironde is called Rive gauche (left bank). The large area between the romantically called "seas" called rivers Garonne and Dordogne Entre-deux-Mers, The Gironde department is part of the large, regional IGP area Atlantique, whereby the Bordeaux winemakers also the production of country wines is possible. This page was last modified at 2 May 2018 at 14:30.